"Painting, like passion, is an emotion full of truth and rings a living sound, like the roar coming from the lion's breast. To paint is to destroy what preceded. I never try to make a painting, but a chunk of life." "Nothing can be explained, all we know is the appearances....The Abstract that permeates all things is ungraspable. In every moment, in every thing, eternity is present." "The act of expressing oneself is a physical one. It materializes the thought." "To get anywhere, one must choose one's mistakes, I chose experimental acts." "No piece of art can depict feelings if a piece of reality is not included in it." Paolo Monti's Jean Dubuffet (1960) shows the artist at work in his studio. Born into an aristocratic French family Michel Tapié de Céleyran, known as Michel Tapié, was trying to make a living as a self-taught musician when artist Jean Dubuffet persuaded him to give up music in favor of writing about art. As the two men began visiting exhibitions, Jean Fautrier's Les Otages (The Hostages) exhibition in 1945 sparked Tapié's passionate involvement in promoting this new art autre, or "other" art. Dubuffet, who went to the opening with him, said "Fautrier's exhibition made an extremely strong impression on me. Art had never before appeared so fully realized in its pure state. The word 'art' had never before been so loaded with meaning for me." Dubuffet found a resonance between his own ideas about Art Brut, or raw art, and Fautrier's navigation of emotional trauma. 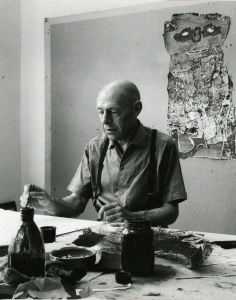 After the encounter and with Dubuffet's support, Tapié threw himself into the art world, taking on many roles, as he edited the catalogue for Dubuffet's 1946 exhibit, became an adviser to the Drouin gallery in 1947, lent support to Georges Mathieu's launch of Lyrical Abstraction in 1947, and helped organize Jackson Pollock's first solo exhibition in Paris in 1951 at the Studio Paul Fachetti. When in 1952 he held the Un art autre exhibition at the Studio Paul Fachetti and published his book by the same title in conjunction with the opening, the show was the culmination of his active involvement in the art world, bringing the individual artists he had promoted under a single umbrella. 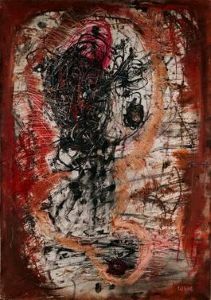 The show, which included Jean Dubuffet, Karel Appel, Jean Fautrier, Jean-Paul Riopelle, Camille Bryen, Ruth Francken, and Wols, gathered the trends of post-war European art under the comprehensive term - Art Informel - and launched the theoretical basis of the new aesthetic trajectory. As a result, Tapié became a leading figure in the art world, as art historian Herschel B. Chipp wrote, "not only as an author of books, criticism, and exhibition catalogues, but also as an organizer of exhibitions of contemporary art in Europe, Latin America, and Japan, and as an adviser to galleries throughout the world." Jean Fautrier's Tête d'otage (Head of a Hostage) (1945) uses abstraction and thickly applied paint to convey the traumas of World War II. Jean Fautrier's 1945 exhibition of Les Otages (The Hostages) at the Galerie René Drouin was electrifying, having a profound effect on not only Michel Tapié, but on the artistic and literary community that saw it as a radical break with the past and the advent of a new art. The poet Francis Ponge described the work's witnessing of "tumified faces, crushed profiles, bodies stiffened by execution, dismembered, mutilated, eaten by flies," while André Malraux, the noted politician and writer, penned an essay for the catalogue, finding the work, "the most beautiful monument to the dead of the Second World War." The series drew upon the artist's experience during the war, when he became part of a French Resistance group of artists and writers that often met at his studio. He was arrested by the Nazis in 1943. When the German sculptor and Nazi sympathizer Arno Breker successfully intervened for Fautrier's release, the artist took refuge in a mental asylum in a Paris suburb. The Nazis regularly used the forest that surrounded the asylum to torture and kill their prisoners, and while the sanatorium residents could not see what was happening, they could hear the harrowing screams. From 1943 until the end of the war, Fautrier worked on the paintings and sculptures of his series, to try and express his horror. Using thick impastos, rough gestures, and near abstraction, the works embodied Art Informel's view that a new "other" art was necessary, impelled by the belief that Western traditions bore responsibility for the war, the concentration camps, and the aftermath. Included under the umbrella of Art Informel, matiérisme, or Matter painting (also known as Matter art) began in the early 1940s in the works of Jean Fautrier and Jean Dubufett. Following Fautrier's lead in thickly painted surfaces, in the mid-1940s, Dubuffet worked on what he termed "haute pates," or "raised pastes," as he used a thick impasto into which he mixed a variety of materials, including sand, cement, ground glass, and asphalt. The technique transformed the flat canvas into a raised and relief-like surface, emphasizing the materiality of the pigment, its tactile surface extending into space. As his work retained figurative elements, Dubuffet would then incise contours into the surface. By the late 1950s, Dubuffet turned to abstraction, as seen in his The Exemplary Life of the Soil (Texturology LXIII) (1958). The work was part of a series he called Texturologies, with which he said he wanted to create an "impression of teeming matter, alive and sparkling, which I could use to represent soil, but which could also evoke all kinds of indeterminate textures, and even galaxies and nebulae." Matter painting was employed by a number of artists including Bram Bogart, Bert de Leeuw, René Guiette, Bernard Schultze, Antonio Tapies and Alberto Burri. Wols' Untitled (1946-47) was the epitome of Tachisme and had much in common with American Abstract Expressionism. While the word "Tachisme" had a long history, as art critic Felix Fénéon first used it in 1889 to identify the painting technique of the Impressionists, its modern usage dates from 1951 with the art criticism of Charles Estienne and Pierre Guéguen. The word "tache" means splash or spot, and the use of blotches, spots or stains of color in abstract painting, along with scribbling that evoked calligraphy, defined this sub-style of Art Informel. Artists often employed pigment directly from the tube as well as employing spontaneous gestural brushwork. Wols was the leading pioneer of the style, and a 1947 exhibition of his Tachisme work, such as his It's All Over (1946-47), had a profound influence on Georges Mathieu and the American Sam Francis. Other artists associated with the substyle included the British Patrick Heron, the French Pierre Soulanges, the Belgian Henri Michaux, and the American Mark Tobey. Abstraction lyrique, or Lyrical Abstraction, was a predominantly French substyle of Art Informel; it favored loose gestural painting with a more sensuous, romantic, or overall more "lyrical" effect. Often using rich color, evoking the natural world, the works were more balanced, animated, and often elegant. The painter George Mathieu coined the term and played a leading role in promoting Lyrical Abstraction, though his conception of it was informed by his enthusiastic response to the work of Wols. In 1947 after viewing the exhibition of Wols work at the René Drouin Gallery, he exclaimed, "Wols has pulverized everything... After Wols, everything has to be reconstructed." Mathieu organized what he called "combat exhibitions," where he would show how the new form of painting "had nothing to do with what continues to be exhibited as contemporary." In 1947 L'Imaginaire, his first combat exhibition at the Galerie du Luxembourg, included Wols, Jean Arp, Jean-Paul Riopelle, Fernand Leduc, and, Hans Hartung, among others, as well as his own work. The art critic Jean José Marchand's introduction said the show revealed, "a lyricism disengaged from all servitude." Other artists associated with the substyle included Maria Helena Vieira da Silva, Patrick Heron, and Nicolas de Stael. Matthieu subsequently wrote a number of manifestos, defining Lyrical Abstraction's four conditions: no pre-existing shapes or references, the artist's spontaneous and unplanned movement, rapid execution, and a state of ecstasy. All four conditions emphasized the artistic sensibility in the moment, uninterrupted by conscious restraints. In 1948, the Danish artist Asger Jorn organized CoBrA, along with Carl-Henning Pederson, Pierre Alechsinky, Corneille Beverloo, Karel Appel, and the writer Christian Dotremont. The name was derived from the first letters of the founders' native cities Copenhagen, Brussels, and Amsterdam, all in countries that had been occupied by the Nazis during World War II. Founded in Paris, the group's ideals were informed by the ruin and aftermath of World War II and a rejection of the society that had created Auschwitz. They emphasized "an art of immediacy," a free expression of the subconscious, and art that valued childlike impulse and spontaneity. Their use of strong colors and bold gestural work to create works of near abstraction and their opposition to traditional modern art and geometric abstraction created a strong affinity with the theory and practice of Art Informel that was developing in France. Many of the artists moved to Paris and there met Michel Tapié who, seeing their works as exemplars of a new and other art, began promoting their work and arranging various exhibitions. At the same time as the Cold War between the Soviet Union and the West developed, the artists, many of whom were Marxists, found themselves politically conflicted, and already in 1951 the group disbanded. As a result, many of the CoBrA artists began to associate and exhibit with Art Informel, beginning with the 1952 Un art autre exhibition. The formation of the Japanese Gutai group, led by Jiro Yoshihara, in 1954 was shaped and strongly influenced by Abstract Expressionism and Art Informel. The name Gutai can be translated as concreteness, and the group experimented with both a wide range of materials, including mud, tar, paint, glue, and water; they emphasized the artistic process through performance and multimedia events. Composed of twenty some young artists near Osaka, the group was united by the desire to create a new art in the void left by the atrocities of World War II and the aftermath of the atomic bomb. As Yoshihara said, "Do what no one has done before!" Art critic Matthew Larking explained Gutai's relevance to Art Informel, saying, "The splattered surfaces of Japanese painter Toshimitsu Imai and the more controlled applications of pigment by Hisao Domoto were integral to Tapié's informel vision. It was these two Japanese artists, then based in France, who introduced the movement to Japan in 1953." Yoshihara and Tapié began a correspondence, and in 1957 Tapié, along with Sam Francis and Georges Mathieu, was invited to Japan where Francis and Mathieu gave public painting performances, which were described "as a whirlwind or typhoon." Tapié found Gutai art "free from conventional formalism, demanding something fresh and newborn," and he included Kazuo Shiraga, Jiro Yoshihara, and Shozo Shimamoto in his 1957 Contemporary World Art exhibition and his 1958 International Contemporary Art Exhibition as well as the International Art of a New Era: Informel and Gutai. Due to Tapié's influence, in 1958 Gutai artists, such as Kazuo Shiraga began to focus on painting, as Tapié said that works on canvas sold for higher prices, were easier to transport to international venues, and would connect with Western audiences. By 1960, Art Informel had been eclipsed in the critical discourse by American Abstract Expressionism and was subsequently viewed as an art movement confined to post-war Europe. Nonetheless, many of the artists associated with the movement continued to make important and influential works. Burri's work influenced the development of Arte Povera, while Asger Jorn's influenced the 1980s turn to Neo-Expressionism. Dubuffet's exploration of raw materiality had a profound impact on the Post-Minimalists as Robert Morris, Eva Hesse, and Alan Saret. By the late 1960s, a reaction against Minimalist and Conceptual art led to a return of lyrical and expressive painting and was marked by a 1971 Whitney Museum exhibition entitled Lyrical Abstraction, that showcased American artists, including Helene Aylon, Pat Lipsky, Dan Christensen, John Seery, and Thornton Willis. Informed by Abstraction Expressionism, Color Field painting, and the Tachisme associated with Art Informel, the American version of Lyrical Abstraction employed new technologies, such as spray guns, in order that the viewer "read" the painting as if it were an object. However, as the movement was critiqued for its sensuous and somewhat romantic and decorative treatments, the term became a pejorative term until the late 1980s when art historians like Daniel Robbins argued that the term had "historical credibility" and should be re-evaluated. As a consequence of this re-evaluation, interest was also revived in Art Informel. Major exhibitions, such as the 2012 Art of Another Kind: International Abstraction and the Guggenheim, 1949-1960, and Soul of the Underground, Jean Dubuffet's 2014 retrospective at the Museum of Modern Art, have continued to spark contemporary interest. Fautrier painted a deeply textured, organic shape, mottled with greens, browns, creams, and pinks that evokes an organic, even humanoid shape, set against a tactile, earthy ground. The crimson s-curve located in the top right barely suggests part of a face or a profile in the process of decomposition. 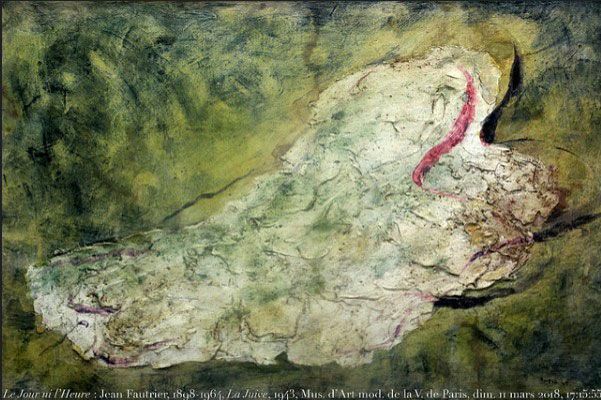 Responding to the Nazi torture of his fellow French comrades, Fautrier hoped to communicate the traumas and existential malaise felt in postwar Europe, and yet the painting's almost jewel-like beauty caused discomfort among viewers. La Juive, or The Jewess, is part of the artist's series Les Otages (The Hostages) (1943-45), which in large part sparked the Art Informel movement. 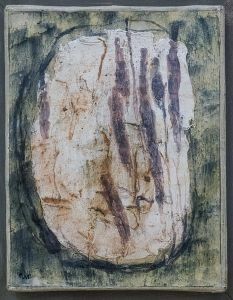 Its abstract and rough "otherness" connected with the materiality and non-traditional paint application championed by Tapié and others, and the organizing principles of the 1945 exhibition of Les Otages emphasized the work's confrontational power, as the paintings were hung closely together in rows that evoked prisoners lined up for execution. Fautrier and other artists associated with Art Informel sought to grapple with the state of society and culture after World War II and with their art made a brute challenge to viewers to do the same.